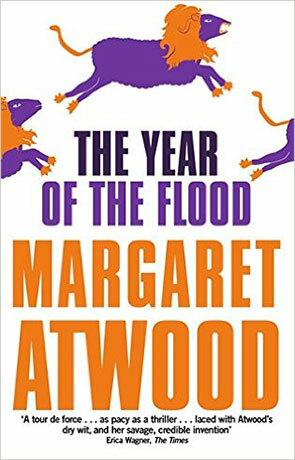 The Year of the Flood is the second novel in Margaret Atwood's post-apocalyptic series and follows the viewpoints of Toby and Ren, members of a religious cult. The book tells the story of some of the events leading up to the cataclysm mentioned in the previous novel Oryx and Crake and there is a good deal of crossover with Jimmy (Snowman) and Crake given some cameo roles. If you haven't read Oryx and Crake I would recommend reading that first — although it's not essential and the way Atwood structures both books they can be enjoyed individually or even out of sequence. The world Atwood describes feels so close to where we are right now as a society and it just one small step further down the road we are currently travelling — a near, possible future. This is a future where big corporations run things in a clearer light and with much greater control than they do now. It's a future of biotechnology, augmentation and genetic engineering where animals are changed and new ones created. It is in essence the natural progression of a commercialist society where morality has vanished and consumerism is valued above everything else. The environment is given little thought except by a few, those few seen as extremists. One such group who still care about the World's ecosystem are the "God's Gardeners", a christian-eco cult who shun modern living and believe that the simple life of gardening, worship and rage against the capitalist regime is their calling. They work against the pollution and over-use of the Planet's limited resources and live for the day of the "waterless flood" that will see mankind thrown down. The people of this cult form the bones of the story, both Toby and Ren are members — led by "Adam One" — and its through their lives that we understand that even those that still care about the planet are not neccesarily "good" people. The depiction of the cult is entirely convincing and entertaining, but with no-holes barred either. Atwood pulls no punches in describing the less savory aspects of Gods Gardeners and some of its members. The story moves between pre and post apocalypse which breaks the story up and keeps the reader on their toes. Ren is the ex-girlfriend of Jimmy and it's great to read their relationship from her perspective — a wonderful idea by Atwood and one that works tremedously well. The pace is spot on and there is never a dull moment, occasional well placed humour lightens the mood and prevents the book becoming too dark for too long. The writing is simply superb, Atwood is a truly gifted wordsmith — it helps to elevate the novel from being a great speculative fiction novel to one that those who don't like "genre" should be able to enjoy without thinking they are reading something they shouldn't. The Year of the Flood is a wonderful book, intelligent, rewarding and thoughtful fiction that is jam-packed with ideas and thoughts on religion, science, society and of course mankind itself. Highly recommended. Written on 11th April 2016 by Ant.